Sellers are often reluctant to engage in the M & A process because they have pre-conceived notions of what they can and cannot get from a transaction. Yet we find that “Sellers can have it all, they just have to ask”. Not only with respect to price, but also the terms, the amount of time the seller may stay with the firm, etc. What they don’t realize is that they are in the driver’s seat. Sellers can structure a transaction any way they want, provided their practice is attractive. Even the idea of finding the right buyer is easier and more viable than most sellers believe (with a marketing plan). Examples of Transactions based on specific Exit Strategies for Accounting Practice Sales. We have dozens of other ‘case studies’ based on unique transactions. Acquisition – Selling 100% of the equity with an exit strategy targeted between three and five years. 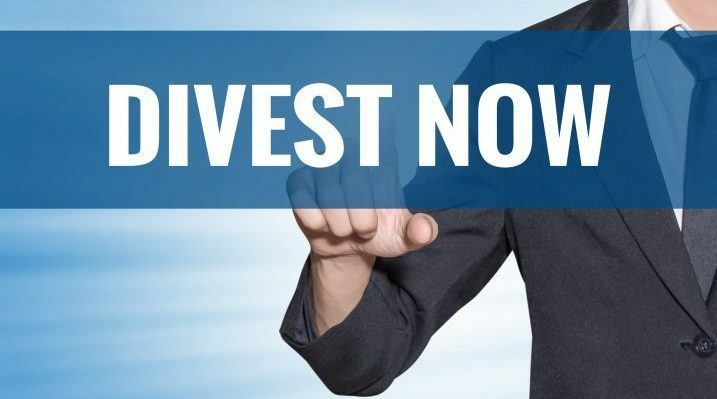 Buy-In – Selling less than 100% equity interest (usually less than a majority) to a partner for long-term growth with an eventual exit strategy (5 to 10 years). Buy-Out – Selling out one, or more, of the retiring partners’ interests while the others remain with the firm. Retiring partners’ exit strategy is within one to two years. 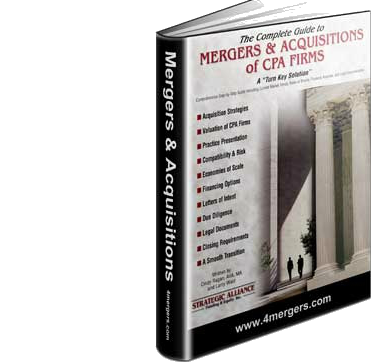 Merger – Two firms joining resources, not necessarily exchanging any cash, and redistribution of equity for long-term growth and market share. These transactions usually represent long-term exit strategies; more than 10 years. 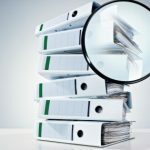 Smaller Firms buying Larger Firms – When junior partners do not exist (or qualify) to succeed the existing partners, having a smaller firm (with its own book of business) buy-in to a practice provides a long-term exit strategy, along with cash flow. This strategy allows the larger firm to maintain control over its practice while grooming a successor. Larger Firms buying Smaller Firms – In this instance, the larger firm almost always purchases 100% of the equity. A pay-out structure that includes sharing in the upside of any growth is usually part of the deal, with an exit strategy that can be either long, or short-term. In either instance, the selling partners are trading resources and an exit strategy for control over their firm. 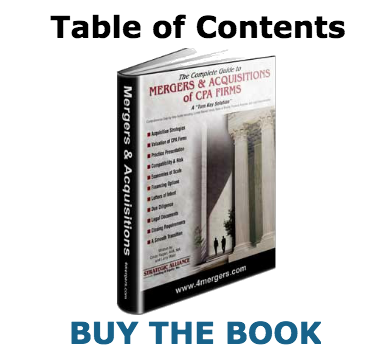 Some of the traditional myths and practices that have characterized the M & A market for CPAs are simply defunct in the present-day, dynamic, market place. Myth – Sellers’ compensation will be reduced after the sale if they stay with the firm. Not True.